Hi Everyone, hope you are enjoying your Christmas/New Year break – a great time to recharge your creative batteries and reflect on where you’ve been and where you’re going to :). Learning a new technique or a whole new crafty medium can be like opening the curtains to a fantastic eye-opening view full of possibilities and promise – whether it be a ‘making day’ spent with a friend playing with ideas and different mediums, a community education night class, a weekend workshop, or even a retreat. Next month, I am looking forward to attending one such event…. the ‘Summer Silver Retreat’ in Haumoana, Hawkes Bay. 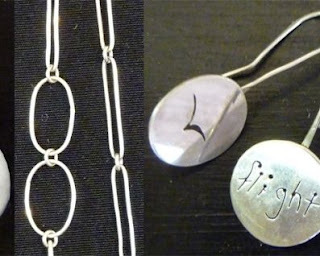 Two renowned New Zealand Jewellery Artists – Charmayne Dobbs and NZHMs’ own Ingrid Schloemer are offering a weekend dedicated to Jewellery Making with Silver and I can’t wait to expand my jewellery technique skill set. I’m very excited to be given the opportunity to learn traditional Silversmithing and expand on a day class I attended earlier this year using Precious Metal Clay. The possibilities I imagine with these new ideas/techniques have me bouncing in my chair with anticipation! Time for you to share - what are your creative plans/wishes for the coming year? 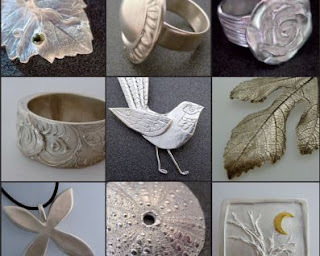 If you are interested in attending the Summer Silver Retreat too there may be a couple of spaces left… 15/16 January, $275 includes tuition, use of tools, firing service, material: 10g silver plate + wire (value $15), 2x 7g “Art Clay” Silver+ 2 cubic zirkonias (value $60), BBQ dinner on Saturday night, drinks and nibbles throughout the weekend. Accommodation not included but can be arranged close by or camp on the ground! Enquiries and bookings: 027-4909919, charmaynedobbs at slingshot.co.nz or Ingrid (Silverworks) 022-0116645, arcadia.nz at mac.com , or check out this link to Silverschool. How wonderful - I would love to learn to work with silver. My focus for Jan is boring 'ol paperwork - business and marketing plan. Its nice to reflect on the year thats been and dream and plan for the year ahead, thats what I keep telling myself as I crunch numbers!